Your chickens will need properly formulated chicken feed that is the correct type for their age, for growth, sustenance and to produce eggs if they are hens of egg laying age. There are many old wives tales and alternative views on feeding, some say it’s marketing that has created all of these feeds and hens will survive well on wheat and others will say their grandad never had layers pellets and just fed his hens kitchen scraps! Formulated poultry feeds didn’t exist until recently, primarily created thanks to commercial research on hens diets as we tried to squeeze more and more eggs out of hens. 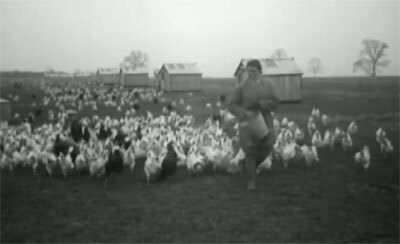 Chickens were often fed home made grain mixes before the seventies. In days gone by though when ‘grandad fed scraps’, pure breeds were kept for eggs and they were fed grain mixes or dried mash chicken feed that had meat or fish meal added to increase the protein content. Hens would free range over a large area and could also supplement their diet with what they could forage. Bugs, insects and worms are all valuable sources of protein, not forgetting a good selection of greens providing vitamins and minerals. So in short, if you don’t feed a proper formulated layers feed to your hens, they won’t be able to keep up the demands that egg-laying puts on their bodies. Chickens require protein to produce feathers and eggs as well as to grow. The amount of protein in their diet is important and you will see on the ingredients on the back of bags of commercial feeds the percentage of protein that they contain. 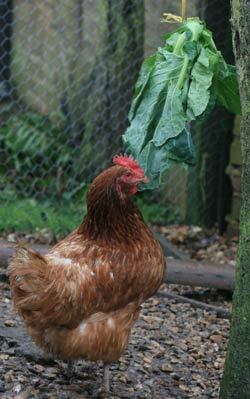 It is higher in ‘Growers Pellets’ for example to enable chickens to grow and produce feathers. You will find that chickens stop laying eggs when they moult (lose their feathers and regrow new) as they are diverting protein from egg production to feather production. During the moult, you can scatter a handful of cat kibble in the run which helps them to top up with protein. Do not use dog food as most of the protein is derived from cereals. 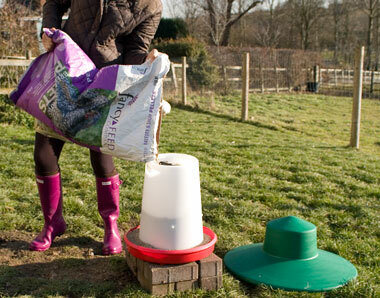 Commercial feeds contain the right balance of nutrients & can be fed ad-lib in hoppers if kept dry. This one has a rain hat. Commercial chicken feeds have been well researched and contain the correct balance of minerals and nutriets required by chickens as well as sufficient protein and calcium which is essential for egg shell production. 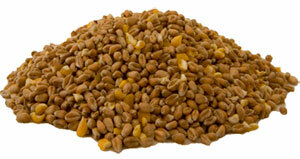 Layers pellets for example are around 16% protein. Wheat is about 10% protein and lacks essential vitamins that are required by chickens. Formulated feeds come as pellets or mash and should be fed ad-lib so hens can take what they want as they need it. This type of feed must be kept dry or it will soon spoil. The feeder and rain hat shown above is the only sort I have found that really does keep the feed dry. Most have a hole in the top of the hat for a handle or for hanging and this lets water in. A feeder and rain hat similar to this one can be bought from Omlet. Eggs are made up of around 80% protein so if there’s a shortage of protein in their diet, egg laying will be the first thing they your girls cut back on! 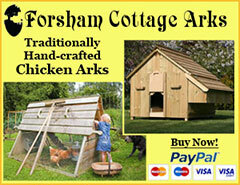 There is more information on the poultykeeper.com site which has a very good page of feeding chickens and chicken feed. Mixed corn is usually 80 to 90% wheat and 10 to 20% maize. It is useful as a scratch feed, it keeps hens active, scratching around looking for it but should only be considered a treat. 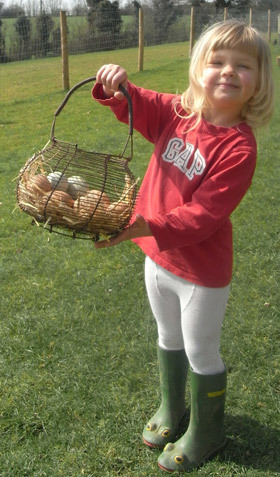 A handful per hen thrown late afternoon helps them to have a full crop overnight. The maize (yellow in colour) is very fattening but can be useful during very cold weather to help your hens keep warm – I increase my girls’ ration of corn when it is cold over the winter, after they have finished moulting (they need lots of protein during the moult) since they are not laying eggs and need a little extra fat to burn in order to keep warm. If you feed too much corn, your hens will get fat and fat hens don’t lay eggs! Feeding household scraps is no longer allowed according toi DEFRA and can be a bit hit and miss anyway. You don’t really know what a hen is getting and the diet is very unbalanced. It is for this reason that scraps used to be mixed into a mash by using layers mash and water (which can be warm in winter). The mixture should be a sort of crumbly mix, not too wet but not too dry. 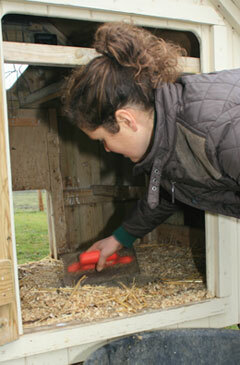 Feeding scraps should be limited to at most 25% of a hens diet so as not to tip the balance too far one way or another. 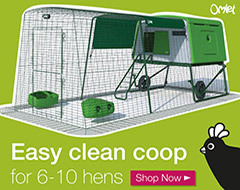 Ample green stuff should be provided for your hens. Grass cuttings, weeds and off-cuts from cabbages, cauliflowers and other greens can be provided at minimal cost. Lettuce should be fed in moderation because it has very little nutritional value (very little Protein and Energy / Calories) and avocado pear is poisonous to hens but most other greens that come from the kitchen will be appreciated by your girls. Try hanging greens in their run, just a little higher than they can reach. As they eat them, they will need to jump to get the last bits so will be getting exercise at the same time as their greens! Win-win! If you have an area in which you can grow cabbages in your garden, it may be worthwhile thinking about growing a row for the winter. Cabbages will sit there in the cold, perfectly preserved until picked. You will need to keep them covered with fleece when there are cabbage white butterflies around but don’t worry if they are a little eaten, the chooks won’t mind! Many chicken keepers like to buy mealworms or chicken treats containing these. Chickens love these and are easily tamed by using such tasty treats, however you should keep in mind that animal by-product regulations mean that mealworms are not really allowed to be fed to poultry. We bought 5 hens and they are about 18 weeks. We are feeding them layers pellets and a bit of corn and veg in the afternoon. Should we be giving them grit too? At the moment they are in a large run but they will be allowed to start free ranging in about a week. Yes, they need soluble grit for egg shell production and flint grit for digestion to grind their food down. A plant pot buried in the ground full of mixed grit is a cheap way of doing this. They won’t always take it because they will pick some up whilst free ranging and most feeds contain enough calcium for egg shell formation but it’s very cheap to provide and makes sure they have enough. This is such a helpful and informative website – thank you! 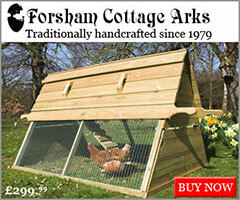 We are newbie chicken keepers and have four bantams aged between 15 and 19 weeks. They’re in a covered run much of the time but are allowed to semi-free range on the grass when we’re around. They have access to growers pellets all the time but we tried them on a spray of millet yesterday and they absolutely devoured it. Is this to be considered as a treat (i.e. occasionally in late afternoon as with corn) or could it be fed daily and if so, how much? They don’t seem keen on green veg (so far, cabbage, sprouts and broccoli) but loved yogurt, porridge and watermelon. In the two weeks we’ve had them, I’ve only tried each of these once and haven’t yet repeated any of them. They scratch around in the run, which is currently gravel but we’re thinking of changing it because we can’t see the droppings clearly and usually end up treading in them ourselves! Any suggestions greatly appreciated! Thanks. You should start changing your birds over to layers pellets now. They may not start laying over the winter due to the lack of light… but they will start in the spring. It’s great that you allow them out of their run, chickens love a little free range. Millet is sold for aviary birds but there is no harm in giving the chickens some of it as a treat if they enjoy it. I am not sure of the protein content and it’s unlikely to be suitable as a feed for laying hens but the small amount you are giving is great as a treat! Unless birds are brought up with certain greens, they can be fussy, especially if they are finding alternatives. I would try them on a number of greens and see what they like… If they are really fussy then the chances are they have enough from their free range time so don’t worry too much. I have found chickens like this will always go for ‘Winter Greens’ available in the supermarkets over the colder months when other things are in short supply. In the run, gravel can be washed through with a hose, but after a while this gets messy so maybe a better choice is wood chip which can be changed every few months. The chickens will enjoy scratching through it but you can rake it over. If you are keeping hens in a run then mash takes longer to eat and takes up a greater proportion of the birds day thus reducing the chance of boredom occurring. I have monitored my birds and they spend a much greater time at the food hopper during the day when they have mash. I did find that they were getting fussy when I fed mash for a while – they would pick out certain bits of it that they liked and tried their best to flick the rest out of the hopper onto the floor looking for these bits. You asked me to let you know how I got on, so here goes. We changed from gravel to wood chip for the base of the run and that has been much easier to cope with (although it does end up everywhere when the girls have a digging session). We have added several perches but, of course, they all end up on the same one – the highest. They have discovered a taste for spring greens and swede and I hang these up from the roof of the run rather like a pinyata so they have to work for it. They love millet, which I give a couple of times a week, grapes (but not at current prices!) and sultanas/raisins although these are restricted to a little treat when we first go out in the morning to get them used to feeding from our hand. They have been on layers pellets now for several weeks – and today we had our first egg!! Such a surprise as we didn’t expect anything until Spring. The Buff Orpington seems the most likely candidate as she is the oldest, has a lovely red comb and wattles and squats down now when we go to pick her up. The other three are a little way behind in maturity but, you never know! Thanks again for all your suggestions. Kind regards. I’m am feeding my four chickens layers mash and I was giving them grit but they weren’t taking it then I looked at the feed and it seems it has little stones in is this normal? Also would a cat go for a white Sussex? Also my Sussex’s comb isn’t nearly as red as the rest I’ve them about a month? Some feeds contain grit. Whilst it can seem cheaper to buy these feeds, keep in mind some of the weight is grit (which is very cheap on its own). If they are picking up enough grit elsewhere then they won’t eat much of the grit you provide. On true free range, they hardly touch their grit. Cats don’t usually bother with chickens, but the odd one will show an interest… it’s best to be observant and watch what happens. The larger the hen, the better. The comb goes bright red when a hen is in lay. At this time of year, hens usually stop laying because there is insufficient light. They lay most of their eggs in spring and into summer. Often pullets hatched in the summer will come into lay in the winter months so you may get some eggs but be patient, it is better for a pullet to put on enough weight before coming into lay or she will lay small eggs and fewer of them because she is still trying to grow. I love your website. We have one chicken that is laying her eggs under the feeder. A few days ago, I enhance their lay boxes (3), and I had 6 eggs all in the boxes. That was good for 1 day, (maybe due to hubby adding another golf ball to 2 of the boxes). Do you have any suggestions for me? Our chicks are approximately 27 weeks. I would also leave the golf balls in there for now- if there are already ‘eggs’ in a nest, they think ‘it must be a good place to lay because another chicken has laid here’! Perhaps you could put a couple of bricks or similar under the feeder to stop them getting there to lay as well. Wow good minds think alike. This is my first time dealing with farm animals ( I am used to dogs, cats, small vet med), and I was also thinking of the bricks under the feed. I am not so sure about the feed sack. Their lay boxes are in an area of the coop that really doesn’t get much light, but I will try something. Thank you so much. I would suggest having a look at my page on What to keep in stock for a suggestion of things you’ll find useful outside of the initial chicken house / run / chickens / chicken feed purchase. As for housing, the Omlet houses look good and although not everyone’s cup of tea, can save you lots of problems with red mites which tend to live in the cracks of wooden houses and come out, hopping onto your birds at night for a feed. There’s more here on my page housing chickens. Can I keep 1 hen in the house as a pet? I have 3 cats, a rat terrier, & small birds, canaries & finches. The chicken would be an experiment. I’m not comfortable with keeping it outside. How do I ensure I get a hen? Don’t forget, chickens are flock animals and it is unkind to keep just the one. They are better kept in 2-3’s as a minimum. Hi, I’m new to keeping chickens too! I’ve just got our first coop and run, suitable for 3 chickens. I am wanting to get ex-battery hens. Can you advise on feed etc, as I know they won’t be used to an outside home! Also, the run is on paving so what is best covering base for ease of cleaning etc? Thanks. Ex Batts have usually been fed dry layers mash. You can buy this from larger stores and it can be a good start for them before switching them over to pellets if you prefer the ease of use of these. For the run covering, hardwood chippings are preferred by most people but you can also use rounded 20mm gravel or sand. Do not use bark chippings as these can contain mould spores which can be harmful to chickens. Grass, dandelions and weeds are good, but you can use shop bought winter greens, cabbage and other trimmings. If you provide a darkened / private nesting area, they will normally use it out of instinct. If they start laying on the floor, put a few eggs in the nest boxes and they will usually start to see these and realise that this is a good place to lay.